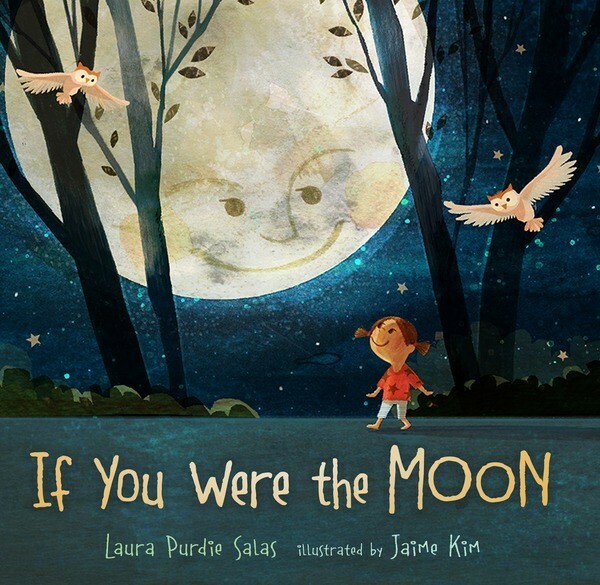 I’ve long admired Laura Purdie Salas’s poetry and picture books. I’m also kind of moon-nutty. So after reading Laura’s latest—If You Were the Moon (Lerner 2017)—I was eager to have her visit us here at PBB. And, look—here she is! AND there’s a giveaway! As always, to win a copy of this beautiful book, leave a comment below. Helloooooooooo up there, Moon! I’m sooooooo tired. I wish I could do exactly nothing, just like you. The moon then proceeds to set the girl straight, telling her—in brief, poetic language—all the things she does, like “Challenge the ocean to a tug-of-war.” Sidebars on each spread offer kid-friendly explanations on all sorts of fascinating moon-related things. Can you tell us how the book came about? I just think the moon is magnificent, and this project started out as strictly a “Things to Do If You Are the Moon” poem to honor the moon. This poem form is a metaphorical list poem written to an inanimate object, and I love writing them. I already had in mind the scientific prose sidebars, as my dad spent most of his career at NASA, and I love science, too. Did you always imagine it as a dialogue between the moon and a child? I tried a couple of different options, and the child/moon one felt the best. I still wasn’t sold on it at first, though. Honestly, I really liked just the poem. But over time, I came to agree that it was needed in order to orient the reader. The writing is a lot of brainstorming—you’re absolutely right! 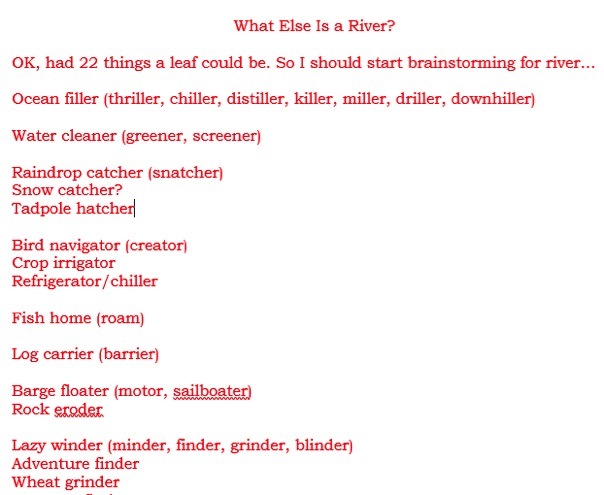 Here’s part of my very first notes that evolved into Water Can Be… It’s really a lot of wandering wordplay. Were they intended as a series from the get-go? These were not intended as a series. A Leaf Can Be… was getting a lot of love from Lerner and good buzz, and I was coming up with other nonfiction book topics. Then it slowly dawned on me, “Hey, maybe I could do this again.” Luckily, Lerner was game! Those books were pure delight to write. You do a lot of writing for the educational market. How is that different from writing trade picture books? SO different. For the educational market, it’s filling someone else’s needs and writing it the way the editor wants it written. It’s like working a puzzle—meeting certain standards and word counts and so on. For the trade market, it’s taking a form or topic I need to write, and playing with it and trying to tell that story in a way that someone else might want to read. Educational writing is a break, actually, because the hard decisions are already made! And because they aren’t as close to my heart—they don’t hold as much power over me and my moods. I’ve spent some time on your excellent website (which made me feel like a complete slacker!). In addition to picture books, you write poetry, blog posts, books about writing, newsletters and offer video classes (among other things). I’m always interested in how productive people allocate their time. How do you prioritize? What do you enjoy the most? My productivity comes from two things, I think. 1) I get bored easily. 2) I need to earn a certain amount of money or go find a job. So I’m motivated! Poetry and trade picture books are what I enjoy the absolute most. But I am kind of a born teacher, too, I think (and former 8th-grade English teacher). It IS a struggle juggling it all, and my process changes regularly. Right now, what’s working for me is to pick ONE writing project that is my top focus each month and ONE business-related project. Each “normal” (non-speaking, non-traveling) workday, I try to spend 2 hours on writing and 2 hours on major business stuff, and everything else is overhead tasks—answering emails, creating promotional materials, signing contracts, etc. For focus, I work in 25-minute blocks, with 5-minute breaks in between. Even I can ignore email and dishwashers for 25 minutes at a time:>) More details here for any process geeks. Any new books we can look forward to in the coming months? Also, I’m working on a book for children’s writers called Making a Living Writing for Kids. I plan to have it out this fall, and it will give writers some concrete information and a real peek into the world of a working children’s writer. (For a glimpse of what this looks like, check out Laura’s detailed report in her annual series: How Much Money Does a Writer Make?—LA). Finally, can you tell us a bit about your services for writers? Thanks, Linda! I’m such a fan of your work. 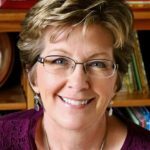 It’s an honor to be here on Picture Book Builders! 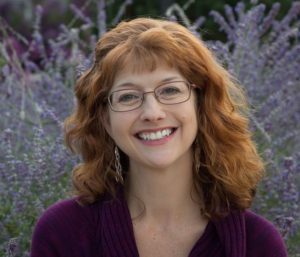 And picture book writers, read Linda’s Nuts & Bolts Guide. And, no, she didn’t ask me to say that! Ha! Thank you, Laura! And thanks so much for visiting! To win a copy of If You Were the Moon, leave a comment below by September 10, 2017. I’ll announce the randomly-selected winner in my September 19th post. If You Were the Moon, Jaime Kim, Laura Purdie Salas, Linda Ashman, nonfiction. Bookmark. Because I’m such a humble guy, I do not review my own book here. I love Laura’s work. Thank you, Linda, for profiling her here and bringing this latest book to my attention. I love the book and the illustrations are amazing. A great way to educate and entertain. Thanks, Judy–they are, aren’t they? Jaime’s next book is Kate di Camillo’s La La La. I’m over the moon for this book! (see what I did there?) Thanks for spotlighting an amazing poet/author. Hehe–I do see what you did there, Bridget. Thanks! What a beautiful book! It is always so amazing to get the background on how a book came to life! Thanks so much! I second the previous comments! Love this work of art and text! Thank you so much, Lynne Marie! Thanks, Linda, for this fun opportunity to share If You Were the Moon! Looking at the post, I’m struck once again by Jaime Kim’s gorgeous artwork. I have had the best luck in getting matched with wonderful illustrators, haven’t I? Thanks so much for visiting, Laura. I loved having the chance to chat! And, yes, Jaime’s artwork really is gorgeous! Thanks for sharing the inspirational post. Love If I Were The Moon. This book looks as amazing as all of your others and I can’t wait to read it! The illustrations looks wonderful too. How great to combine a story, poetry and factual information in one beautiful package. This book is amazing. I’ve always been fascinated by the moon! Thanks, Sharon–me, too! It was so fun to finally write a whole book about it! After watching the eclipse yesterday, I’m thrilled to find a great moon book that kids and teachers will love! Thanks for sharing with us! I am very inspired by your writing and consider your books mentor texts for me as I continue developing my own skills. Thank you for sharing about your process! I love this book – so beautifully done! This post was so perfect for the day after the eclipse! Thanks for sharing! And if you didn’t get to see the eclipse (I didn’t), then the lovely art can at least be a substitute:>) Thanks, Katie! This book is perfect for the solar eclipse! Beautiful! Thanks for sharing with us! What a lovely and timely book, Laura! I saw the eclipse yesterday in Charleston, SC at the baseball stadium where NASA scientists gave viewers incredible info for 2 hours before the clouds parted enough for the enthralled audience got to don our eclipse glasses and watch this once in a lifetime event. You already know I am a big fan of your books and when I get home tomorrow I will make sure to read this new one. Linda, I admire your work as well. 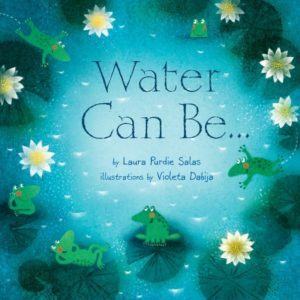 Thank you for hosting Laura and sharing her beautiful new poetic and fact-filled picture book! Thank you, Carole. I am so glad you got to experience the eclipse. It sounds amazing! I adore your A Leaf Can Be…series and look forward to seeing this book, too! Thanks, Katelyn. These picture books I’ve been doing with Millbrook/Lerner have just been a joy to write. Great interview, Linda! I now teach PreK and would love to share this book with my students. PS I use RAIN! often in my class and it’s always a big hit! Thank you, Jenny! And I love the way Linda manages two parallel and then intersecting stories in such a clear, wonderful, minimal way in RAIN. Your example of “wandering wordplay” is excellent. I love that. And I appreciate knowing your process details and schedule organization. Thanks for the link. Thanks, Deslie:>) Playing with words is my favorite thing to do! What a great post Laura and Linda – very informative and inspiring for writers! Your book looks beautiful Laura! Great interview, Linda. I’m always in awe of authors that can present educational subject matter using lyrical/poetic language. I can’t wait to read this book! Thanks, Laura for sharing your brainstorming techniques. I’m going to check out your website! Thank you for the wonderful, inspiring interview. Love your books! Sweet, informative and full of imagination! Congrats! Wonderful interview! I enjoyed hearing about all the books. If You Were the Moon sounds lovely, it’s going on my list! I too have the moon on my mind after the fun yesterday watching the eclipse. Thanks for the peek into your process! Laura has worked very hard at her draft for a long time and her hard work is paying off for readers of all ages! Thanks for sharing this book and the productivity tips! I love when authors use poetry in picture books. This story looks wonderful! Thank you so much for sharing it with us. Love Laura’s work & she’s so very inspirational. I love the moon playing tug of war with the ocean! I could use this picture book with my 8th grade science class. Thank you for this interview. It always helps to see other writers’ processes. Laura, I am such a fan of your work! Thanks for stopping by on my favorite PB website! I love this idea of a story and nonfiction together. I’m going to learn so much from reading your book. I currently write mostly for the educational market, so I found your comments interesting about this subject. I also find writing educational books like a puzzle and have used those exact words to describe it myself. And at first it was difficult to let go and write for another person’s preferences, but it is actually easier emotionally. Exactly! For me, it’s almost like off-season training for my passion projects. Keeps my skills up, pays some bills, challenges me in totally different ways. Thanks for reading, Danielle! Beautiful! I look forward to reading–& giving to my nerdy 6-year-old granddaughter! Thank you, Ruth! And hooray for nerdy granddaughters! I love the concept and process of IF YOU WERE The MOON. I can’t wait to read this book and the new writing craft book, too. It’s so exciting to see this latest release. Kids (and I) are drawn like magnets to any title that starts: If You Were…, and in this case the draw is only the tip of attraction. I use your series and other titles with kids and in professional development groups- always to rave reviews and great excitement. Thank for this post. What a wonderful premise for a picture book, and a very interesting interview. Thank you! I already have this book and I reviewed it. I loved it. Thanks for sharing. I love the juxtaposition of lyricism and sidebar facts IN ONE BOOK. Kudos to Carol Hinz for having the foresight and to you, Laura, for being able to implement so effectively. It’s a fantastic balance of business and creative. Thank you, Laura, you make me want to work harder. Thanks, David–I appreciate that! 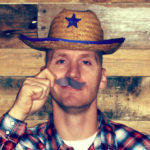 Love the Books page on your website–clever! Best of luck with your writing. Great post! This book looks stunning. I also really appreciated the productivity bit. I can definitely relate to those motivations which do make it easier. Thanks! Thanks, Mike. And I love the expressions on your animal faces! Well, aren’t these delicious books! Every elementary school teacher will want a set to use as a springboard for writing activities. I am also a big fan, Laura. It was interesting to see your brainstorming list too. Thank you for the interesting article. Thank you, Leslee (or Leslee Anne). I love seeing writers’ processes. We all go about it in such different ways, but with the same kind of thinking usually at the core of it. I love the cover art and concept of If You Were the Moon. Your “Can Be” titles are great mentor texts. Thanks! What a wonderful post! I love your books, Laura, and I look forward to getting IF YOU WERE THE MOON. Thanks, Cathy! Good to see you here! Thank you for writing such a lyrical story about the moon and combining it with pertinent facts. I love it. Congratulations! Your poetic picture books are so captivating–I’m thrilled to hear that a new one has launched! The cool and lyrical facts paired with those luminous illustrations should attract kids of all ages! The concept is brilliant! Thank you for sharing. Laura, I loved how If You Were the Moon gently reminds us that the moon is more than just pretty sky dressing. A view definitely reinforced by the recent solar eclipse, making it a perfect post-event read. Or re-read. What everybody else said. 🙂 I bought this one. So beautiful! Congrats, Laura! Ever since my kids have heard so much about the eclipse, they are very interested in the moon and sun. This would be a great book for them! Wow! Such a beautifully crafted book. It looks so well done from the pics I saw. Makes me want to go outside and talk to the moon myself 🙂 ! I’d love to read this one! Very timely for a book about the moon. I love the idea of mixing a lyrical story with Non-fiction. Very interesting to hear about your process–the brainstorming. I love the explanation about the difference between writing for trade and educational markets. I knew there was a difference, but not the details. Very interesting. Thank you for sharing. I love Laura’s work so this was a treat to read. So much great info here. Thanks. WOW. Great reveals on mentor text and process and just another beautiful got to read it lovely looking book. Thanks. I love the sound of all your books. I’ll track them down. Thanks for sharing about your work and process too. I love Laurie’s books and can’t wait to read this one. Congratulations! I can’t wait to see this one! The concept is brilliant, and I know Laura’s writing will be beautiful. I don’t know which I liked better–learning about this book or about how it came to be. I’m a big fan of “A Leaf Can Be…” and it was such a bonus to learn the origins of that series as well. Thanks very much for sharing. Thank you Linda for introducing me to Laura and her work! 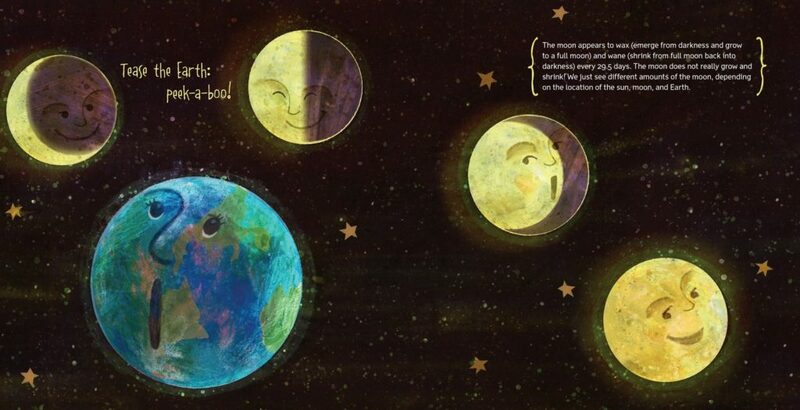 The moon book looks beautiful and fun! And, as an aspiring PB writer I checked out info on Laura’s forthcoming work on making a living as a children’s book writer! Thanks Linda and Laura! !